Squares are one of the defining features of London. Like other European cities, London has its grand civic spaces, but no other city has developed the garden square in quite the same way. London squares are different because they were built for people to live in. The layout of Georgian and Victorian squares created an ordered, spacious arrangement of streets and leafy open spaces which has made an enduring contribution to the quality of life in London. Today, London's squares are a vital part of the city's fabric: a focus for local communities, attractive to tourists, and pleasant places for Londoners in which to live, work and relax. They can also be a haven for wildlife, important links in the green chain between the city's parks and back gardens, and occasional oases in built-up areas. Social changes, two world wars, building development and neglect all took their toll on squares in the 20th century. The London Squares Act of 1931 was hugely important in protecting more than 400 of the city's squares from being built over, and without it many of the squares we enjoy today may not have survived. 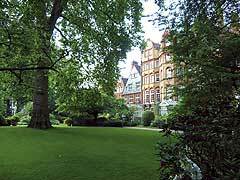 Today, private squares with their mysterious, shady gardens co-exist with those run by councils, more open in their layouts and often with playgrounds and sports facilities. Public ownership has allowed more people to enjoy the delights of squares, which provide vital access to recreation and green surroundings in poorer urban areas. 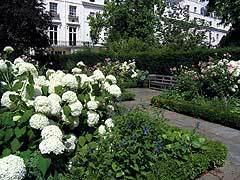 Events such as Open Garden Squares Weekend allow public access each year to many of the private squares, ensuring that their contribution to London's environment can be appreciated by all. 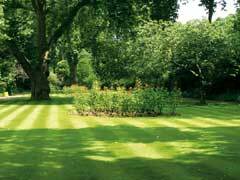 Awareness of the value of London's parks and gardens has grown in recent years, and there is renewed commitment to the conservation and improvement of squares, both public and private. English Heritage has undertaken several major restorations, and many smaller renovations have been completed, thanks to support from the Heritage Lottery Fund, local authorities and others. This site tells the story of squares, and highlights how much has been done - and remains to be done - to preserve this integral part of London's landscape.